The Arctic Ocean is unique among oceans in its isolation. All other oceans form part of a single great system centered on the Southern Ocean, while the Arctic, like the Mediterranean Sea, is an almost closed basin with only one deep passage permitting easy exchange of water and heat with its surroundings, the so-called Fram Strait between Svalbard and Greenland. A very narrow passage of lesser depth, the Nares Strait between Greenland and Ellesmere Island, forms a link with Baffin Bay, while all other connections with the Atlantic and Pacific, through the Barents Sea, the Canadian Arctic Archipelago, and Bering Strait, are very shallow. The Arctic is composed of two deep basins, the Eurasian Basin and the Canadian Basin, each exceeding 4300 m in depth, and separated by a narrow straight ridge called the Lomonosov Ridge, which crosses the Arctic from Siberia to Greenland (see Lomonosov Ridge; Canadian Basin; Amundsen Basin; Nansen Basin). Depths along the ridge crest are typically 1000 m; a shallow peak at 610 m was discovered in 1994. The Lomonosov Ridge is not a spreading center where new crust is being created; instead it is thought to be a narrow strip of former continental crust that split off the edge of Siberia when the Eurasian Basin opened some 100 million years ago. 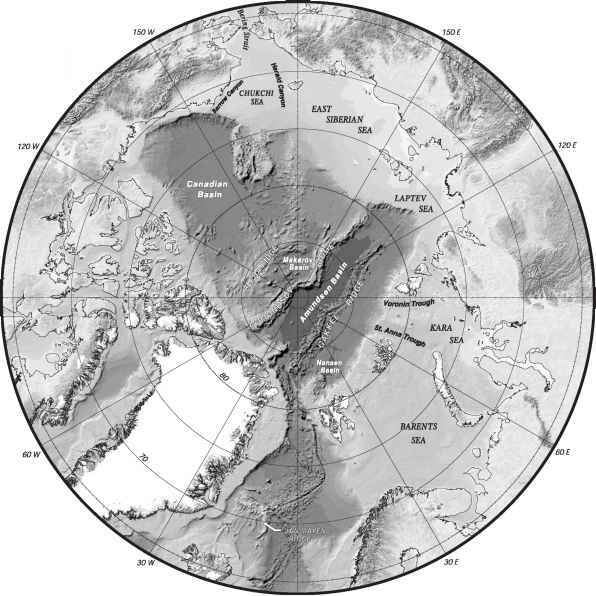 The true spreading center, the Gakkel Ridge or Arctic Mid-Ocean Ridge, lies along the axis of the Eurasian Basin and is much deeper than the Lomonosov Ridge, dividing the Eurasian Basin into the Nansen Basin to its south and the deeper Amundsen Basin to its north (see Arctic Mid-Ocean Ridge). 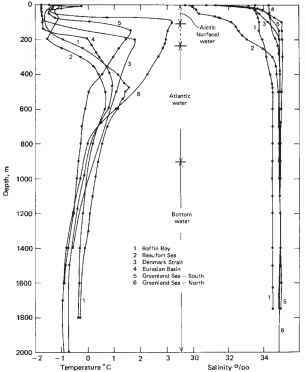 In the Canadian Basin, there is a complex bottom topography, with the Alpha Ridge (a convoluted plateau region) possibly representing an ancient spreading center from a much earlier period of geological history (see Alpha Ridge). Figure 1: Bathymetry of the Arctic Ocean. Figure 2: Typical Arctic Ocean salinity and temperature profiles. out 600 km from shore. Groups of islands divide the Russian shelves into separate seas—the Chukchi, East Siberian, Laptev, Kara, and Barents, moving from east to west (each of these have their own Encyclopedia entry). The result is that the Arctic Ocean as a whole has the least mean depth (1800 m) of any ocean. The outer edges of the shelves are marked by deep canyons or troughs, which are important in providing routes for newly produced dense water in winter to run off the shelves into the deep basin. Figure 1 shows some important canyons—St Anna and Voronin Troughs in the Kara Sea, Barrow Canyon off Alaska, and Herald Canyon in the Chukchi Sea. The water mass structure of the Arctic Ocean (Figure 2) is a three-layer system. The uppermost layer is called polar surface water. It is up to 200 m thick, is at or near the freezing point, and has a very low surface salinity of 27-34 psu, compared to 35 psu as an average for the world ocean. The low salinity is caused by the very large influx of fresh water from huge river systems such as the Ob', Lena, Yenisey, and Mackenzie which drain vast areas of Asia and North America. Figure 3 shows the annual average freshwa ter fluxes from these rivers, and also shows the watersheds of rivers draining into the Arctic and into Baffin Bay (dashed line); the Arctic drainage basin includes about half of the Asian continent. Figure 4 shows how surface salinity varies over the Arctic, with the lowest values found near the mouths of the great rivers. The river discharge mixes with sea water over the shallow continental shelves and is then able to spread over the central Arctic Ocean as a surface layer. Only in early winter does this situation change, when the formation of new sea ice over the shelves causes the water there to increase in density due to salt rejection; it can then run down into some deeper level of the Arctic Ocean via the canyons, a process known as shelf-slope convection. Figure 2 shows that the depth at which the temperature rapidly increases, the thermocline, does not coincide with the depth at which the salinity rapidly increases, the halocline. Part of the Arctic Ocean, mainly the Beaufort Sea region, is called the cold halo-cline zone, since the deeper part of the surface water layer, at 150-200 m, remains cold but already has a salinity that is rising toward its deep water value (e.g., profile 2; see Cold Halocline). In the Eurasian Basin and Greenland Sea, the temperature and salinity rise nearly together (e.g., profile 5). The reason is that in the Beaufort Sea the surface water characteristics are affected by an inflow from Bering Strait of cold, high-salinity water, which enters the Arctic Basin at a depth of 150-200 m as it comes off the Chukchi and Alaskan shelves. The influence of this water extends almost to the Lomonosov Ridge. In recent years there is evidence that the cold halocline has retreated far back into the Beaufort Sea (Steele and Boyd, 1998), indicating either a diminution of the range of influence of Bering Sea water as opposed to water of Atlantic origin, or a reduction in the influence of Siberian river water due to a change in its surface circulation pattern (Martinson and Steele, 2001). Since the cold halocline acts as a barrier to upward heat transport, its retreat should result in higher ocean heat fluxes and thus an increased melt rate of sea ice in the Arctic—and there is certainly evidence that the ice has become substantially thinner in recent years (Rothrock et al., 1999; Wadhams and Davis, 2000). western edge of the Barents Sea as it moves north. The rest of the water is from the same source, but enters the Arctic Ocean further to the east via the St Anna and Voronin troughs, having crossed the Barents Sea. From about 800 m to the bottom, the water temperature drops below 0°C again and continues to slowly decrease with increasing depth. This lower water mass is called Arctic Ocean Deep Water. It is again of Atlantic origin, but suffers much modification in its very sluggish circulation around the basin (Rudels, 1995). Because of the sill depth of the Lomonosov Ridge, the deep water of the Eurasian Basin is slightly different in characteristics from that of the Canada Basin, and also from the deep water of the Greenland Sea, although it is capable of mixing with the latter via Fram Strait. Figure 4: Variation of surface salinity (psu) over the Arctic Ocean. Gyre, and a motion of translation, the Transpolar Drift Stream, in the Eurasian Basin (see Beaufort Gyre; Transpolar Drift). 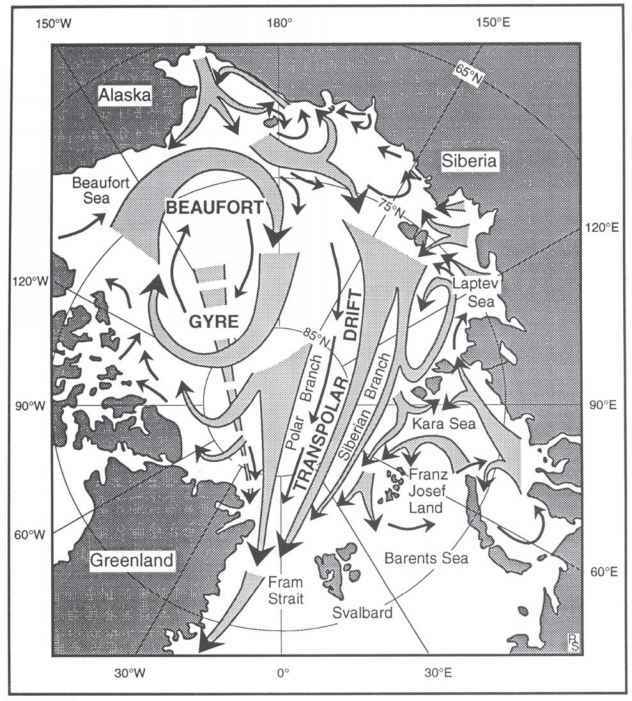 Ice in the Beaufort Gyre requires 7-10 years for a complete circuit. 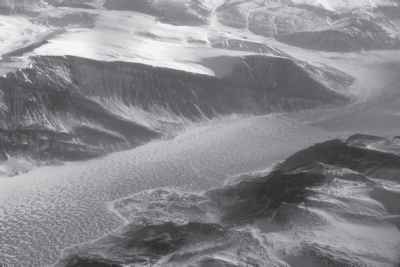 The Transpolar Drift Stream collects ice and water from the Eurasian shelves and transports it across the Pole and down toward Fram Strait, requiring about three years for this drift. The Drift Stream is renamed the East Greenland Current after it passes through Fram Strait and enters the Greenland Sea. 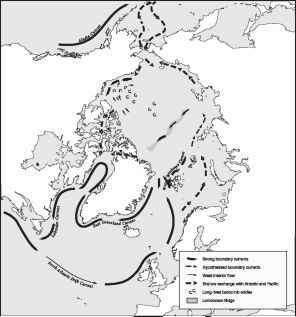 This is the route for most of the ice that leaves the Arctic Basin, and so it is through Fram Strait that most water and heat exchange occur between the Arctic Ocean and the rest of the world ocean. Much of the heat exchange occurs in the form of latent heat transported northward as the ice moves southward. The whaling captain and Arctic scientist William Scoresby first postulated the existence of this transpolar current because of his observations of great masses of old ice passing into the Greenland Sea from the Arctic Basin. However, it was Fridtjof Nansen who put the idea to the test by freezing his specially constructed ship Fram into the ice off the New Siberian Islands in 1893, hoping to drift across the Pole. 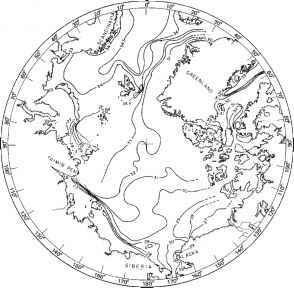 The ship missed the Pole, but in 1896 emerged in what is now known as Fram Strait. Nansen was inspired to carry out this drift by the discovery off south Greenland of wreckage from the exploration ship Jeanette, which had been crushed in the ice off Wrangel Island north of Siberia. The wind system that drives this flow arises from the presence of the polar high over the center of the Beaufort Sea, with a ridge extending over Greenland. Figure 6b shows the long-term average pressure field that prevailed over the Arctic Ocean from the 1960s to the 1980s, generated by averaging the air pressures measured by the drifting satellite-tracked buoys that have been deployed by the Arctic Ocean Buoy Program (now known as the International Arctic Buoy Programme). The map shows a high-pressure center over the Beaufort Sea, at about 80° N 140° W, with a ridge of high pressure extending over the high, intensely cold ice sheet of northern Greenland. A rule of thumb for ice drift in unconstrained conditions, developed independently by Nansen and Zubov and thus known as the Nansen Rule or the Zubov Law, is that ice moves parallel to the isobars of a surface pressure field. Thus, the pressure distribution of Figure 6b should give rise to a clockwise circulation of ice in the Beaufort Sea, and a current on the Eurasian side of the Arctic that moves ice from the seas north of Russia across the North Pole and down toward the entrance to the Greenland Sea. This is just what was observed during this era. An extra, but minor, contribution to this circulation comes from the effect of the Earth's rotation on the surface water of the Arctic Basin. The water forms a low-density surface lens that tries to slump outward (i.e., southward) under centrifugal force, but is turned to the right by Coriolis force to give a clockwise rotation, which is then split by the presence of Greenland into a clockwise gyre and a motion of translation, enhancing the pattern of Figure 5 (Wadhams et al., 1979). During the 1990s, this pattern of air pressure changed, and now resembles that of Figure 6a (with Figure 6c showing the difference field between the two). This is having profound effects on Arctic surface circulation, since the Beaufort Gyre is reduced in scope and squashed against the coast of northeast Siberia, while water from Siberian rivers now makes a longer loop around the Arctic (shown especially by Figure 6c) before emerging from Fram Strait. This may account for the lower surface salinity in the Eurasian Basin, one cause of the destruction of the cold halocline in this region. The switch from one pattern of atmospheric circulation to another appears to be a basic property of the Arctic atmosphere, and has been called the Arctic Oscillation (Thompson and Wallace, 1998), with Figure 6a and b being termed the "cyclonic" and "anticyclonic" patterns (Proshutinsky and Johnson, 1997). 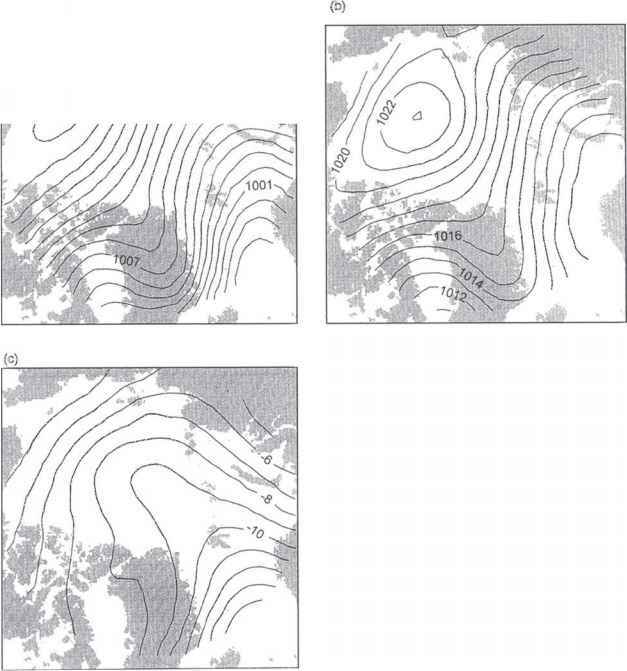 This new idea of a switch between two modes ascribes our "traditional" view of the Arctic circulation (Figure 5) to the fact that the circulation happened to remain mainly in the anticy-clonic pattern during the critical years of the 1950s-1980s when basic research on Arctic currents was first being done thoroughly. Other current systems cannot carry much water to or from the basin because they occur in shallow water. 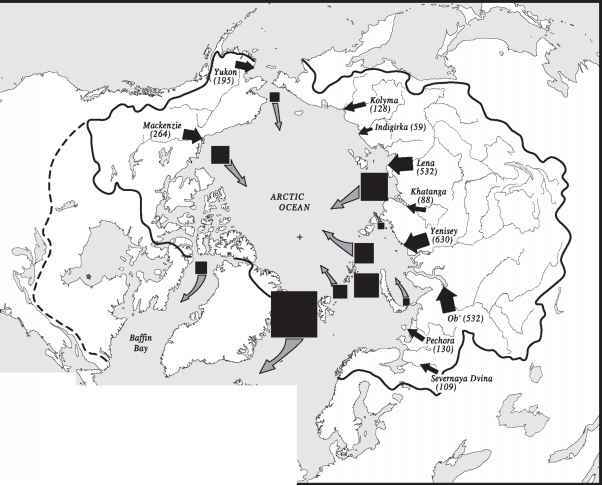 Figure 5: Long-term average pattern of ice and surface water circulation of the Arctic in its "anticyclonic" mode. which carries it down as far as the Grand Banks of Newfoundland, where the cold water has a sharp front with the warm water of the Gulf Stream. Figure 7: Speculative view of intermediate and deep circulation in the Arctic. reaches the beginning of the Lomonosov Ridge at the edge of the Laptev Sea. Here much of the water turns northward and follows the near side (i.e., European side) of the Lomonosov Ridge, ending north of Greenland where it joins the lower part of the Trans Polar Drift—East Greenland Current system. The rest of the water crosses the Lomonosov Ridge and continues to follow the shelf break until it is joined by water of Bering Strait origin; the combined water masses continue eastward around the edge of the Beaufort Sea shelf, joining the other water mass north of Greenland. The mixing of water masses in the Beaufort Sea causes subsurface eddies to form in this region, as shown in the diagram. The two basic aspects of the picture are the net flow from the Pacific to the Atlantic and the eventual recirculation back into the Atlantic of Atlantic water entering the Arctic from the North Atlantic Current—subject, however, to many modifications and vicissitudes en route around the Arctic Basin. Present predictions of climate change models are that the Arctic Ocean should experience a much greater rate of warming than low-latitude oceans. An early consequence will be the disappearance of sea ice in winter from the northern Barents Sea. By the 2080s, the Arctic Ocean may be ice-free in summer, becoming a seasonal ice zone like the Antarctic is at present, with enormous consequences for ecology, transport, and resource extraction.